I am Elizabeth Kim, a rising senior at the University of Southern California. I major in Business Administration, and have a minor in 3D Computer Graphics and Modeling. In a nutshell, I am a Netflix connoisseur, TV show binge-watcher (my current record is finishing twelve seasons of Grey’s Anatomy in two weeks! ), and soon-to-be cat lady. With a great love for TV and film, I see myself working in the entertainment industry, as a marketing director (or, in the best-case scenario, a TV show/movie producer). What do you do at VC? I am the Social Media & Marketing Intern at VC. My main responsibility is creating and pushing content across VC’s social media channels to help create a digital presence. Currently, I am working on Home Is in the Heart promotions as well as profiling our Digital Histories (DH) Filmmakers. What is something that you’re working on that is interesting? For the past few days, I have been conducting interviews with our DH Filmmakers to create profile pieces. It’s been really interesting to hear the impact DH has had on the lives of our Seniors. DH gave them a voice, an outlet for them to tell their stories, and it's really inspiring to hear it from the Filmmakers firsthand. If DH is still around in 40-years, I would definitely join! What is your favorite memory at VC? So far, my favorite memory at VC has been outside the office, but with the VC people! My fellow interns are amazing humans, and our post-work adventures have been very memorable. A memory I will always cherish was our first outing, when we ended up at a Korean restaurant/pub. What happened there will stay there, but I can definitely say that it was a bonding experience. If someone made a movie of your life, would it be a drama, a comedy, a romantic-comedy, action film, or science fiction? I’m a huge fan of comedy, especially mockumentary/cringe comedy shows like The Office and Parks and Recreation (because I'm basic). If someone made a movie of my life, I would love for it to be a similar mockumentary style with awkward and cringe humor, following the uneventful life of Elizabeth Kim. 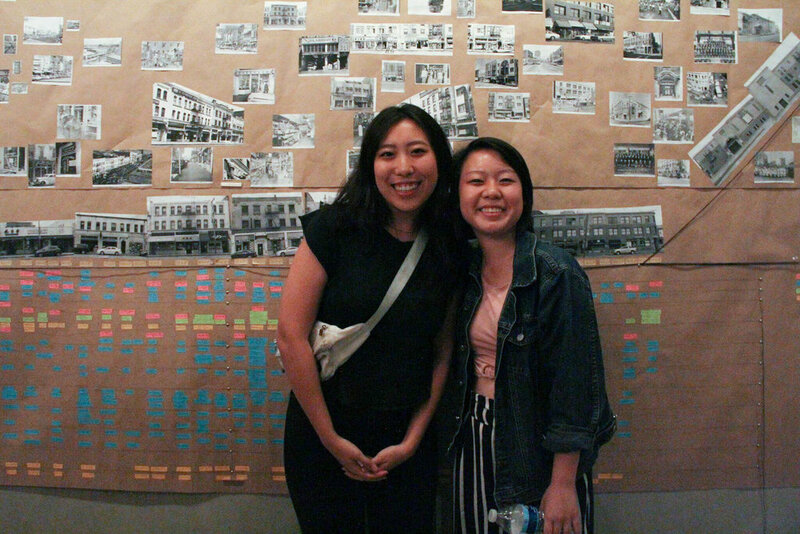 On the evening of July 28th, fellow intern Yong-Yi and I attended Little Tokyo Service Center’s Inaugural +LAB Artist Residency Culmination Event. As VC interns, we came to show support for our Artist-in-Residence (AiR) Tina Takemoto. As soon as we entered the National Center for Preservation of Democracy, we were greeted by Tina’s main project, a huge multisensory mapping project of First Street North, tracking the urban transformations from 1900 to the present. Her project covered the entire wall, with labels that told the stories of businesses long gone. The next thing we noticed was the noren, Japanese fabric hung in doorways, covering the entrance to the Tateuchi Democracy Forum. These noren displayed Susu Attar’s portraits of historical community members. The portraits were combined with kanji characters of “precious” and “bond”, done by fellow AiR Kuniharu Yoshida. We were later surprised to discover portraits of current community members on the opposite side of the noren, visible only as we exited the Forum. The event began with Grant Sunoo, LTSC’s Director of Planning, introducing the program itself. He went on to describe the purpose behind +LAB: to explore how artists and cultural institutions can empower the Little Tokyo (LT) community. The theme of this year's +LAB Artist Residency was Community Control and Self-Determination, in response to the rapid gentrification happening around LT. The first artist to go up was Susu, who described her thought process behind her project. Inspired by the idea of borders and entryways, she used the noren to portray the importance of respecting space. Susu also led a collaborative storytelling event called Tea Afar to reinforce this idea. Centered around the country of Jordan, she created an immersive space for people to tell stories about the country while experience their food and culture. Next up was Kuniharu, a calligrapher and hip hop artist. He started off with his Delicious Little Tokyo performance, a piece where he mixed dirt, taken from Manzanar, with ink for his calligraphy. He also showed a video of elderly community members creating their own calligraphy. To see these Seniors creating art was a touching and heartwarming, a visual that brought *tears* to my eyes. Tina was the third to go up. She talked about her mapping project, First Street Open, and the process of her archival research on First Street North, from the prewar era to present day. It was interesting to see how local businesses changed, especially during the time period when Little Tokyo became Bronzeville. For example, the store on 341½ E. First Street went through many transformations, notably becoming Baby House Cleaners during Bronzeville; today, it is the site of a ramen restaurant, Mr. Ramen. Tina ended the presentation with her experimental film, made with the 16mm film created by participants from her several DIY Film workshops. Last but not least, Dan Kwang’s project was a performance, with Little Tokyo community Member Takayo Fisher. 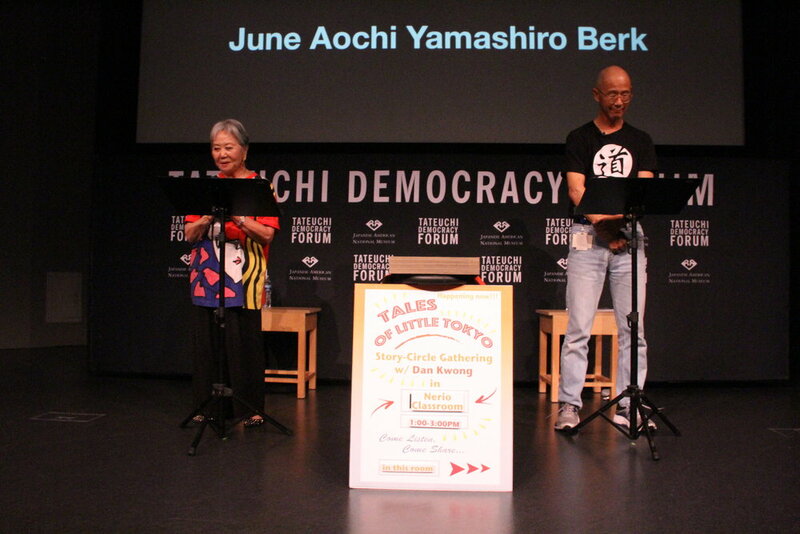 “Tales of Little Tokyo” was filled with anecdotes from community members, ranging from seniors to teenagers. 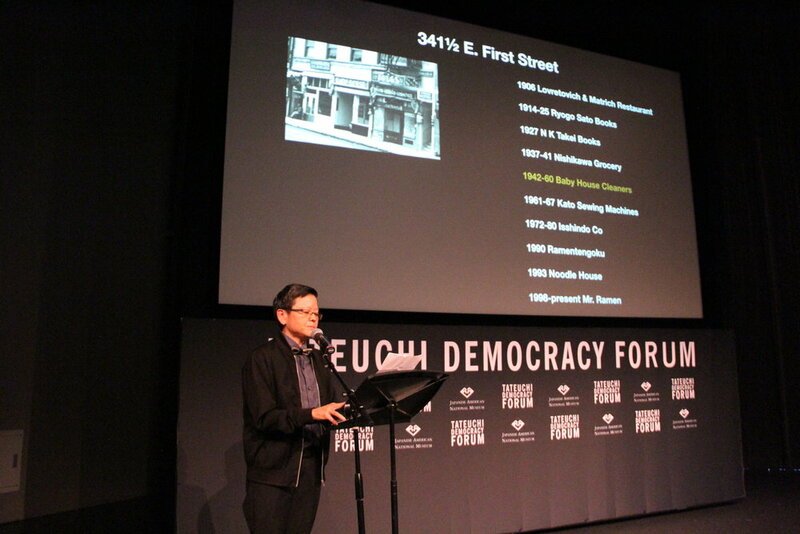 The nostalgic tales centered around their time in Little Tokyo, pre-war and post-war and often at iconic LT stores such as the Fugetsu-do and Far East Cafe. Overall, it was an amazing experience! Being able to see the role of art in activism and empowerment was eye-opening, and the amount of support that these artists received from the community was inspiring. This event really reinforced my love LT, and I am so glad to have been a part of this community.